LONDON – Next month will mark the tenth anniversary of the global financial crisis, which began on August 9, 2007, when Banque National de Paris announced that the value of several of its funds, containing what were supposedly the safest possible US mortgage bonds, had evaporated. From that fateful day, the advanced capitalist world has experienced its longest period of economic stagnation since the decade that began with the 1929 Wall Street crash and ended with the outbreak of World War II ten years later. A few weeks ago, at the Rencontres Économiques conference in Aix-en-Provence, I was asked if anything could have been done to avert the “lost decade” of economic underperformance since the crisis. At a session entitled “Have we run out of economic policies?” my co-panelists showed that we have not. They provided many examples of policies that could have improved output growth, employment, financial stability, and income distribution. That allowed me to address the question I find most interesting: Given the abundance of useful ideas, why have so few of the policies that might have ameliorated economic conditions and alleviated public resentment been implemented since the crisis? The first obstacle has been the ideology of market fundamentalism. Since the early 1980s, politics has been dominated by the dogma that markets are always right and government economic intervention is almost always wrong. This doctrine took hold with the monetarist counter-revolution against Keynesian economics that resulted from the inflationary crises of the 1970s. It inspired the Thatcher-Reagan political revolution, which in turn helped to propel a 25-year economic boom from 1982 onward. But market fundamentalism also inspired dangerous intellectual fallacies: that financial markets are always rational and efficient; that central banks must simply target inflation and not concern themselves with financial stability and unemployment; that the only legitimate role of fiscal policy is to balance budgets, not stabilize economic growth. Even as these fallacies blew up market-fundamentalist economics after 2007, market-fundamentalist politics survived, preventing an adequate policy response to the crisis. That should not be surprising. Market fundamentalism was not just an intellectual fashion. The economist who declared that government policies to maintain full employment were “manifestly unsound” was Milton Friedman. And the market-fundamentalist revolution that he helped to lead against Keynesian economics lasted for 30 years. But, just as Keynesianism was discredited by the inflationary crises of the 1970s, market fundamentalism succumbed to its own internal contradictions in the deflationary crisis of 2007. A specific contradiction of market fundamentalism suggests another reason for income stagnation and the recent upsurge of populist sentiment. Economists believe that policies that increase national income, such as free trade and deregulation, are always socially beneficial, regardless of how these higher incomes are distributed. This belief is based on a principle called “Pareto optimality,” which assumes that the people who gain higher incomes can always compensate the losers. Therefore, any policy that increases aggregate income must be good for society, because it can make some people richer without leaving anyone worse off. But what if the compensation assumed by economists in theory does not happen in practice? What if market-fundamentalist politics specifically prohibits the income redistribution or regional, industrial, and education subsidies that could compensate those who suffer from free trade and labor-market “flexibility”? In that case, Pareto optimality is not socially optimal at all. Instead, policies that intensify competition, whether in trade, labor markets, or domestic production, may be socially destructive and politically explosive. This highlights yet another reason for the failure of economic policy since 2007. The dominant ideology of government non-intervention naturally intensifies resistance to change among the losers from globalization and technology, and creates overwhelming problems in sequencing economic reforms. To succeed, monetary, fiscal, and structural policies must be implemented together, in a logical and mutually reinforcing order. But if market fundamentalism blocks expansionary macroeconomic policies and prevents redistributive taxation or public spending, populist resistance to trade, labor-market deregulation, and pension reform is bound to intensify. Conversely, if populist opposition makes structural reforms impossible, this encourages conservative resistance to expansionary macroeconomics. Suppose, on the other hand, that the “progressive” economics of full employment and redistribution could be combined with the “conservative” economics of free trade and labor-market liberalization. Both macroeconomic and structural policies would then be easier to justify politically – and much more likely to succeed. Could this be about to happen in Europe? France’s new president, Emmanuel Macron, based his election campaign on a synthesis of “right-wing” labor reforms and a “left-wing” easing of fiscal and monetary conditions – and his ideas are gaining support in Germany and among European Union policymakers. If “Macroneconomics” – the attempt to combine conservative structural policies with progressive macroeconomics – succeeds in replacing the market fundamentalism that failed in 2007, the lost decade of economic stagnation could soon be over – at least for Europe. The SEC does its job in taking down a pump-and-dump stock scheme. Government prosecutors love to hunt for big cases on Wall Street, which are great for publicity, but an often-neglected duty is to protect small investors on Main Street. So it’s noteworthy that the Securities and Exchange Commission recently blew up a Long Island-based boiler-room scheme. 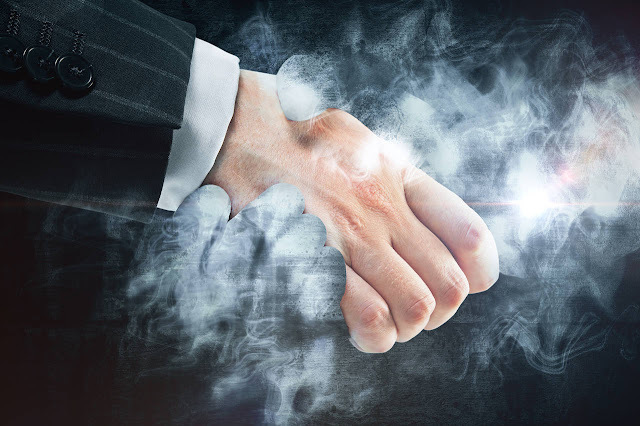 Last week the SEC charged 13 individuals with using high-pressure sales tactics to bilk more than 100 small investors—including many senior citizens—out of some $10 million in savings. The U.S. Attorney for the Eastern District of New York followed with criminal charges. According to the SEC, the alleged swindlers—many of whom had been banned from the brokerage industry—set up a sham financial-services company on Long Island. They used this “boiler room” to buy, trade and inflate the price of penny stocks in microcap companies. Penny stocks trade over the counter at less than $5 a share and are often thinly traded, which makes them easier to manipulate than blue-chip securities on the big exchanges. The boiler boys also used “washes”—e.g., buying 100 shares of a stock at $5 a share with one co-conspirator while selling the same number of shares for the same price to another. This drove up the stock price and created the impression that shares were actively being traded though ownership wasn’t changing hands. Once prices hit a certain level, they dumped the stocks, realizing $14 million in gains while costing victims millions. The SEC was established during the New Deal to protect mom-and-shop investors from fraudsters. But the agency has lately become better known for its headline-making prosecutions of Wall Street barons for white-collar crimes like insider trading, though their alleged victims are often other well-heeled and sophisticated investors. The agency also won plaudits from progressives for rules requiring disclosures on executive pay. But the SEC was asleep when Bernie Madoff and Allen Stanford were bilking investors out of their life savings. New SEC Chairman Jay Clayton told us last week that he plans to make protecting small investors from scams like the Long Island boiler room a priority, and the agency deserves credit for bringing these cases back to the center of SEC enforcement. - Then as it was, then again it will be. 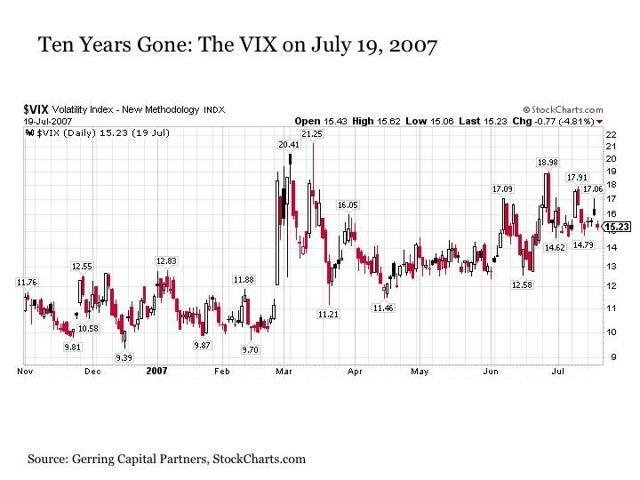 - It was exactly ten years ago today that the U.S. stock market reached its pre-crisis peak. - While the course may change sometimes, the song remains the same. Then as it was exactly ten years ago today. The date was July 19, 2007, and the U.S. stock market closed at another new all-time high. The world was awash with liquidity, risk asset prices were steadily rising, and investor worries were few despite evidence of accumulating risks beneath the global financial system. What subsequently followed over the next 18 months was not only the reemergence of downside risk but the near collapse of the global financial system. Could such a fate possibly be again ten years on? The skies were once clear and all was supposedly well. Ten years have gone since July 19, 2007. What is so special about this date in particular? It was the date that the U.S. stock market as measured by the S&P 500 Index (SPY) reached its peak before the beginning of the end that soon came to be known as the financial crisis. 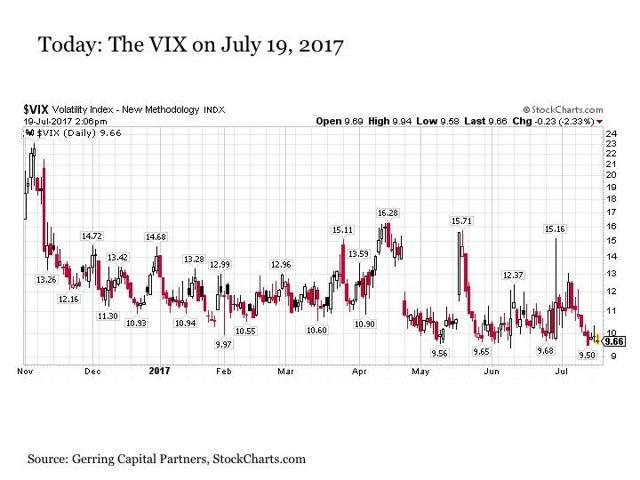 Sure, the S&P 500 Index (IVV) closed marginally higher a few months later on October 9, 2007, but by then the die had already been cast, volatility was spiking, and the game was over. When reflecting on the financial crisis and the years that have followed since the deluge of central bank liquidity tamed its flames, the date that I use to mark the beginning of the end is July 19, 2007. I still remember to this day the mood across capital markets at the time. The summer was hot and stock investors were brimming with optimism. Corporate earnings were steadily rising on both an operating and GAAP basis at the same time that stock valuations were still fairly reasonable in the 16 to 17 times trailing 12-month earnings range. And while 2007 Q1 GDP had been somewhat soft, it was set to rebound to above a +3% annualized rate in the second quarter of the year. At the same time, inflationary pressures were largely contained at around 2% despite the fact that commodities prices (DJP) including energy (USO) were on the rise. Moreover, the U.S. Federal Reserve was contemplating an easing of monetary policy in order to address some of the pressures that were accumulating in the economy associated with the housing industry. Strong economic growth, low inflation, rising earnings, reasonable valuations, and a potential shift toward more accommodative monetary policy from the U.S. Federal Reserve in the months ahead. 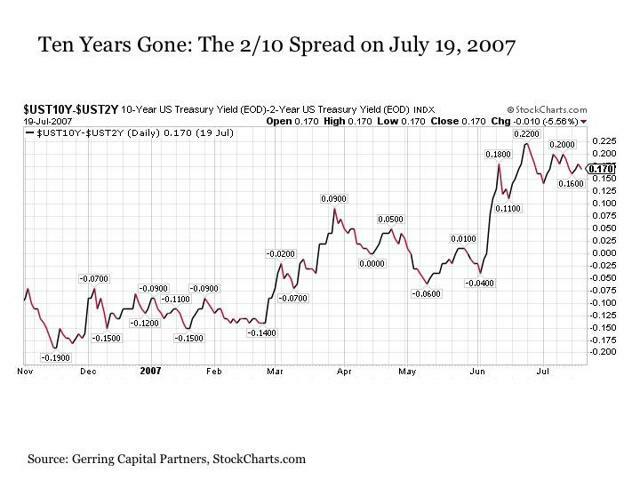 Put simply, what was not to love about investing in risk assets including U.S. stocks (DIA) ten years ago? The subsequent surrender of more than half of total portfolio value over the next twenty months provided the answer. 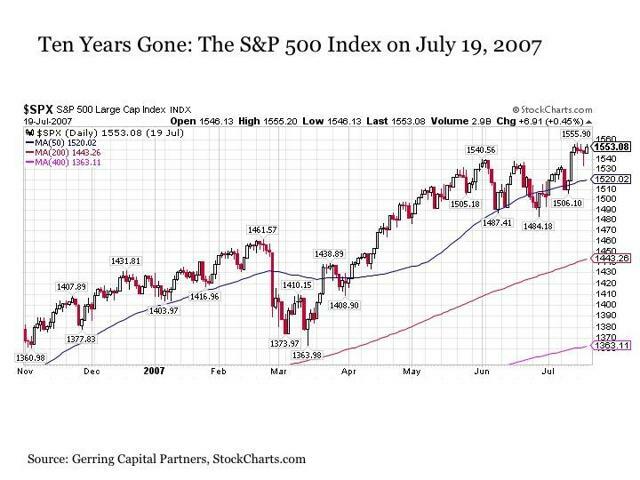 So where are we today, exactly ten years gone from this previous stock market peak? 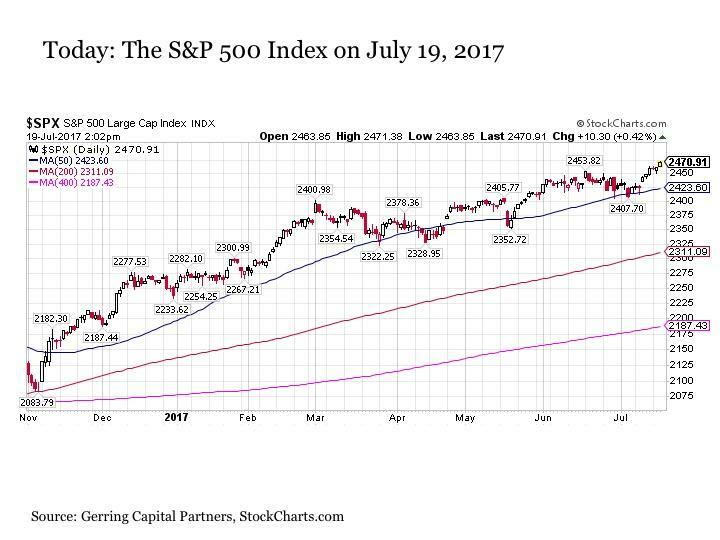 The S&P 500 Index is once again set to close at a new all-time high on July 19, 2017 at a level on Wednesday that is nearly +60% higher than it was ten years ago on a price basis alone. For many investors, it has left them with the understandable feeling that they need not grow from this prior near catastrophic experience. Simply stay the course, endure the short-term volatility that may occur along the way no matter how dramatic, and drift on the rising tide that is the U.S. stock market over long-term periods of time. 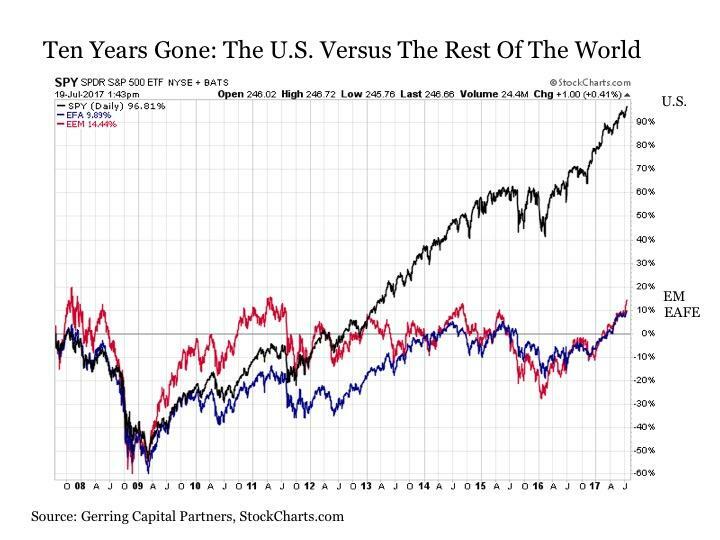 If only investors across much of the rest of the developed and emerging world had been so fortunate as their U.S. counterparts over the past ten years. It also stands to reason whether the U.S. stock market eagle has finished its journey or whether it still flies on the wings of maybe after so many years. So where do we stand today? The U.S. stock market is soaring just as it was ten years ago. Of course, just because the U.S. stock market peaked exactly ten years ago does not mean it is about to do the same today. A number of factors are completely different today than they were ten years ago. Let’s begin with a few indicators on the positive side. First, whereas volatility had been steadily on the rise from historical lows for many months prior to the July 2007 peak, volatility remains at historic lows today. This leads to an important point, which is that we will likely need to see a sustained rise in stock price volatility before the S&P 500 Index reaches a final peak. This point was also true leading up to the tech bubble peak back in 2000. Also, whereas the U.S. Treasury yield curve as measured by the 2/10 spread had already inverted and was starting to steepen again leading up to the stock market peak in July 2007, the yield curve is still flattening and has yet to invert today. While this suggests the stock market eagle has further to go today, it should be noted that the yield curve was still moving toward flattening and further into inversion at the time when the U.S. stock market first peaked during the tech bubble in March 2000. 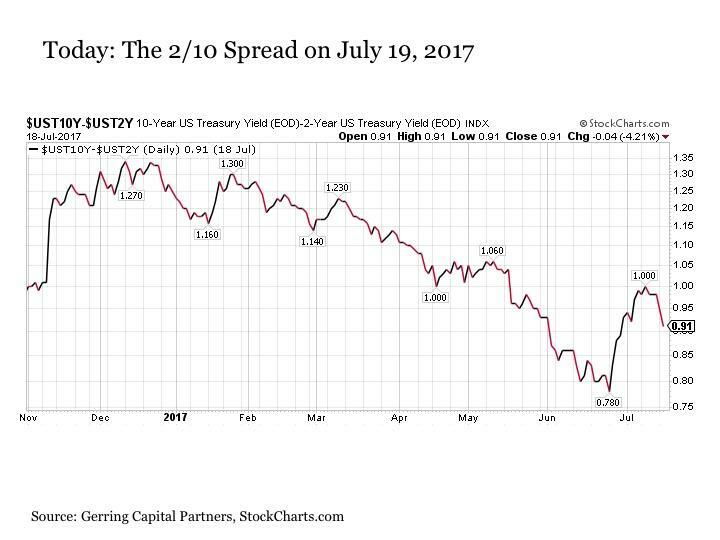 Nonetheless, the fact that the 2/10 spread is still in the 75 to 100 basis-point range suggests time for further flattening may lie ahead. 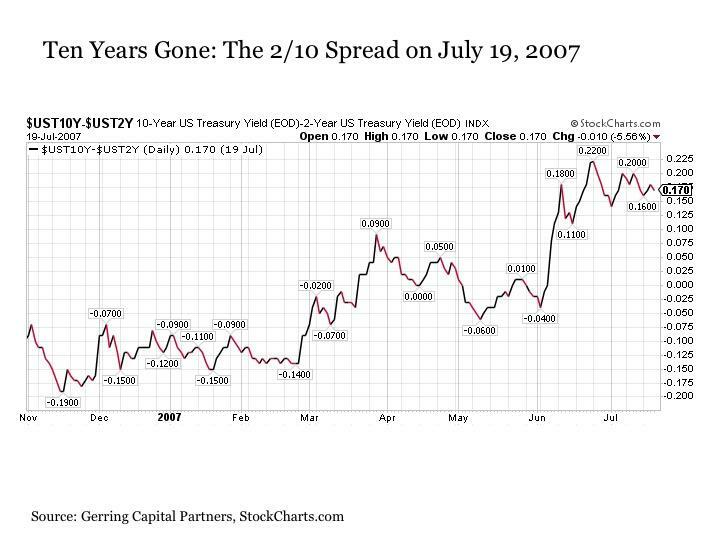 Of course, some characteristics of today’s market pale in comparison to July 2007. The first relates to valuations. For while stocks were trading at around 16 to 17 times trailing earnings back in July 2007, today they are trading in the 22 to 25 times earnings range. While some seek to explain today’s valuation premium away by citing historically low interest rates, it is worth noting that equity risk premiums based on the 10-Year Treasury yield are still at best comparable. Moreover, short-term interest rates are on the rise thanks to the Fed, and according to many (myself not included) are headed higher across the yield curve. The second relates to monetary policy. Whereas the Fed was headed toward easing monetary conditions in July 2007, it is moving assertively toward tightening monetary conditions today. Of course, overall monetary conditions remain increasingly easy thanks to the continued liquidity pumping from the European Central Bank and the Bank of Japan, but this is also expected to measurably subside, not expand, in the near term. The third relates to the economy. Prior to the onset of the financial crisis, U.S. economic growth as measured by real GDP was simply more robust in the 2% to 4% range versus the chronic 1% to 2% growth that we have been experiencing for so many years today. Put more simply, the markets in 2007 still had a decent engine, whereas today it has already been sputtering on liquidity and fumes for years now. Overall, the course is different today than it was ten years ago. But just as it was, then again it will be that fundamentals will eventually matter as rivers always reach the sea eventually. So too will accumulating systemic risks. This does not appear likely to begin on July 20, 2017 or even over the next couple of months for that matter. But what history from ten years ago reminds us is that it does not take long for the market tides to suddenly turn, for a world awash in liquidity to suddenly turn bone dry, and for the unexpected to turn into the traumatic for those that are not prepared. On a closing note, one thing that has not changed over the past ten years is the blind eyes of central bankers. Read the following and manage your portfolio downside risk accordingly. "We believe the effect of the troubles in the subprime sector on the broader housing market will be limited and we do not expect significant spillovers from the subprime market to the rest of the economy or to the financial system"
Oh no, you didn’t! For those investors that are sleeping well at night depending on the omniscience of global central bankers, beware. It has been ten years gone since the last stock market peak and the very beginning of the onset of the financial crisis in the U.S. stock markets. While the course has changed dramatically in the ten years since, and it is likely that today’s market still has time to grow, in many respects the song remains the same. 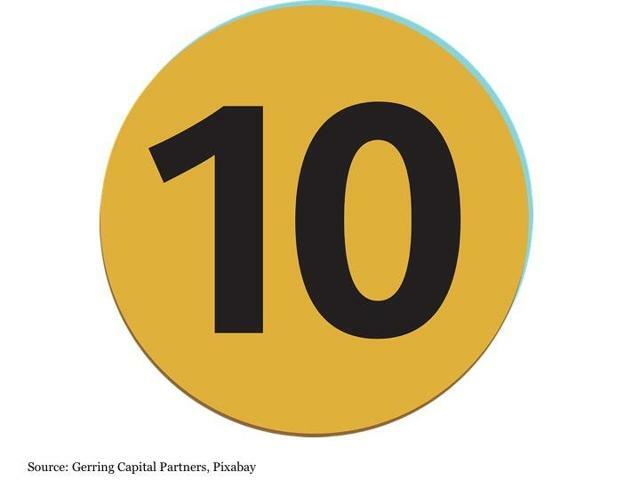 Enjoy the good times while they last, for capital market history has shown that liquidity fuel love inevitably gives way to reality and how things are ultimately meant to be. Robots that serve dinner, self-driving cars and drone-taxis could be fun and hugely profitable. But don’t hold your breath. They are likely much further off than the hype suggests. A panel of experts at the recent 2017 Wharton Global Forum in Hong Kong outlined their views on the future for artificial intelligence (AI), robots, drones, other tech advances and how it all might affect employment in the future. The upshot was to deflate some of the hype, while noting the threats ahead posed to certain jobs. Their comments came in a panel session titled, “Engineering the Future of Business,” with Wharton Dean Geoffrey Garrett moderating and speakers Pascale Fung, a professor of electronic and computer engineering at Hong Kong University of Science and Technology; Vijay Kumar, dean of engineering at the University of Pennsylvania, and Nicolas Aguzin, Asian-Pacific chairman and CEO for J.P.Morgan. Kicking things off, Garrett asked: How big and disruptive is the self-driving car movement? It turns out that so much of what appears in mainstream media about self-driving cars being just around the corner is very much overstated, said Kumar. Fully autonomous cars are many years away, in his view. One of Kumar’s key points: Often there are two sides to high-tech advancements. One side gets a lot of media attention — advances in computing power, software and the like. Here, progress is quick — new apps, new companies and new products sprout up daily. However, the other, often-overlooked side deeply affects many projects — those where the virtual world must connect with the physical or mechanical world in new ways, noted Kumar, who is also a professor of mechanical engineering at Penn. Progress in that realm comes more slowly. At some point, all of that software in autonomous cars meets a hard pavement. In that world, as with other robot applications, progress comes by moving from “data to information to knowledge.” A fundamental problem is that most observers do not realize just how vast an amount of data is needed to operate in the physical world — ever-increasing amounts, or, as Kumar calls it — “exponential” amounts. While it’s understood today that “big data” is important, the amounts required for many physical operations are far larger than “big data” implies. The limitations on acquiring such vast amounts of data severely throttle back the speed of advancement for many kinds of projects, he suggested. In other words, many optimistic articles about autonomous vehicles overlook the fact that it will take many years to get enough data to make fully self-driving cars work at a large scale — not just a couple of years. Getting enough data to be 90% accurate “is difficult enough,” noted Kumar. Some object-recognition software today “is 90% accurate, you go to Facebook, there are just so many faces — [but there is] 90% accuracy” in identification. Still, even at 90% “your computer-vision colleagues would tell you ‘that’s dumb’…. But to get from 90% accuracy to 99% accuracy requires a lot more data” — exponentially more data. “And then to get from 99% accuracy to 99.9% accuracy, guess what? That needs even more data.” He compares the exponentially rising data needs to a graph that resembles a hockey stick, with a sudden, sharply rising slope. The problem when it comes to autonomous vehicles, as other analysts have noted, is that 90% or even 99% accuracy is simply not good enough when human lives are at stake. “To have exponentially more data to get all of the … cases right, is extremely hard,” Kumar said. So why is one left with the impression from reading mainstream media that self-driving cars are just around the corner? Picking up on Kumar’s theme, Fung, who also helps run the Human Language Technology Center at her university, outlined some of the limits of artificial intelligence (AI) in the foreseeable future, where again the hype often outruns reality. While AI may perform many impressive and valuable tasks, once again physical limitations remain almost fixed. “… A deep-learning algorithm that than can do just speech recognition, which is translating what you are saying, has to be trained on millions of hours of data “and uses huge data farms,” Fung noted. And while a deep-learning network might have hundreds of thousands of neurons, the human brain has trillions. Humans, for the time being, are much more energy-efficient. They can work “all day on a tiny slice of pizza,” she joked. Still, the stage is being set for bigger things down the road. To date, getting those narrow tasks that have been automated have required humans to “learn how to communicate with machines,” and not always successfully, as frustration with call centers and often Apple’s Siri suggests, noted Fung. Today, the effort is to reverse the teacher and pupil relationship so that, instead, machines begin to learn to communicate with humans. The “research and development, and application of AI algorithms and machines that will work for us,” cater to us, is underway, Fung said. “They will understand our meaning, our emotion, our personality, our affect and all that.” The goal is for AI to account for the “different layers” of human-to-human communication. So where might all this lead when it comes to the future of jobs? Fung reminded the audience that that even in fintech, progress will be throttled by the available data. “In certain areas, you have a lot of data, in others you don’t.” Financial executives have told Fung that they have huge databases, but in her experience, it often is not nearly large enough to accomplish many of their goals. The panel’s consensus: The jobs safest from robot replacement will be those at the top and the bottom, not those in the middle. What about many years down the road, when robots become advanced enough and cheap enough to take over more and more human activities. What’s to become of human work? In the past, for engineers, a good academic record guaranteed a good job. Today, tech companies interview applicants in “so many different areas,” Fung added. They look beyond technical skills.